In Part 9 of the ‘guide’ on this blog (neo-liberalism and solutionism), I suggested that the major advocates of adaptive learning form a complex network of vested neo-liberal interests. Along with adaptive learning and the digital delivery of educational content, they promote a free-market, for-profit, ‘choice’-oriented (charter schools in the US and academies in the UK) ideology. The discourses of these advocates are explored in a fascinating article by Neil Selwyn, ‘Discourses of digital ‘disruption’ in education: a critical analysis’ which can be accessed here. 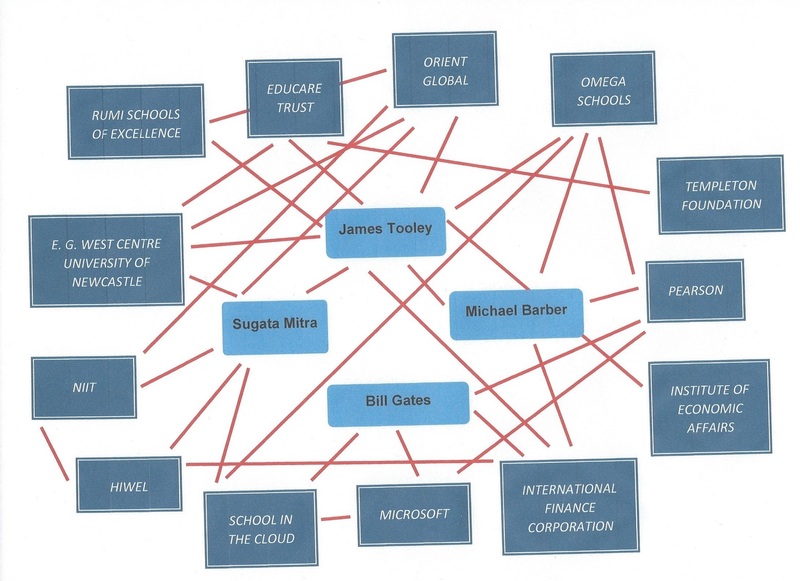 Stephen Ball includes a detailed chart of this kind of network in his ‘Global Education Inc.’ (Routledge 2012). I thought it would be interesting to attempt a similar, but less ambitious, chart of my own. Sugata Mitra’s plenary talk at the IATEFL conference yesterday has generated a lot of discussion, so I thought it would be interesting to focus on him. What such charts demonstrate very clearly is that there is a very close interlinking between EdTech advocacy and a wider raft of issues on the neo-liberal wish list. Adaptive learning developments (or, for example, schools in the cloud) need to be understood in a broader context … in the same way that Mitra, Tooley, Gates et al understand these technologies. In order to understand the chart, you will need to look at the notes below. Many more nodes could be introduced, but I have tried my best to keep things simple. All of the information here is publicly available, but I found Stephen Ball’s work especially helpful. Bill Gates is the former chief executive and chairman of Microsoft, co-chair of the Bill and Melinda Gates Foundation. James Tooley is the Director of the E.G. West Centre. He is a founder of the Educare Trust, founder and chairman of Omega Schools, president of Orient Global, chairman of Rumi School of Excellence, and a former consultant to the International Finance Corporation. He is also a member of the advisory council of the Institute of Economic Affairs and was responsible for creating the Education and Training Unit at the Institute. Michael Barber is Pearson’s Chief Education Advisor and Chairman of Pearson’s $15 million Affordable Learning Fund. He is also an advisor on ‘deliverology’ to the International Finance Corporation. Sugata Mitra is Professor of Educational Technology at the E.G. West Centre and he is Chief Scientist, Emeritus, at NIIT. He is best known for his “Hole in the Wall” experiment. In 2013, he won the $1 million TED Prize to develop his idea of a ‘school-in-the-cloud’. Hiwel (Hole-in-the-Wall Education Limited) is the company behind Mitra’s “Hole in the Wall” experiment. It is a subsidiary of NIIT. NIIT Limited is an Indian company based in Gurgaon, India that operates several for-profit higher education institutions. Omega Schools is a privately held chain of affordable, for-profit schools based in Ghana.There are currently 38 schools educating over 20,000 students. Orient Global is a Singapore-based investment group, which bought a $48 million stake in NIIT. Pearson is … Pearson. Pearson’s Affordable Learning Fund was set up to invest in private companies committed to innovative approaches. Its first investment was a stake in Omega Schools. Rumi Schools of Excellence is Orient Global’s chain of low-cost private schools in India, which aims to extend access and improve educational quality through affordable private schooling. School-in-the-cloud is described by Mitra as’ a learning lab in India, where children can embark on intellectual adventures by engaging and connecting with information and mentoring online’. Microsoft are the key sponsors. The E.G. West Centre of the University of Newcastle is dedicated to generating knowledge and understanding about how markets and self organising systems work in education. The Educare Trustis a non-profit agency, formed in 2002 by Professor James Tooley of the University of Newcastle Upon Tyne, England, and other members associated with private unaided schools in India.It is advised by an international team from the University of Newcastle. It services include the running of a loan scheme for schools to improve their infrastructure and facilities. The Institute of Economic Affairs is a right-wing free market think tank in London whose stated mission is to improve understanding of the fundamental institutions of a free society by analysing and expounding the role of markets in solving economic and social problems. The International Finance Corporation is an international financial institution which offers investment, advisory, and asset management services to encourage private sector development in developing countries. The IFC is a member of the World Bank Group. The Templeton Foundation is a philanthropic organization that funds inter-disciplinary research about human purpose and ultimate reality. Described by Barbara Ehrenreich as a ‘right wing venture’, it has a history of supporting the Cato Institute (publishers of Tooley’s most well-known book) , a libertarian think-tank, as well as projects at major research centers and universities that explore themes related to free market economics. Barber is an old friend of Tooley’s from when both men were working in Zimbabwe in the 1990s. Omega Schools are taking part in Sugata Mitra’s TED Prize Schools in the Cloud project. Omega Schools use textbooks developed by Pearson. Orient Global sponsored an Education Development fund at Newcastle University. The project leaders were Tooley and Mitra. They also sponsored the Hole-in-the-Wall experiment. Pearson, the Pearson Foundation, Microsoft and the Gates Foundation work closely together on a wide variety of projects. Some of Tooley’s work for the Educare Trust was funded by the Templeton Trust. Tooley was also winner of the 2006 Templeton Freedom Prize for Excellence. The International Finance Corporation and the Gates Foundation are joint sponsors of a $60 million project to improve health in Nigeria. The International Finance Corporation was another sponsor of the Hole-in-the-Wall experiment.